Fall is in the air this Labor Day Weekend. I picked the cucumbers and made 13 pints of bread and butter pickles. That is enough for the year. We purchased peaches at the Farmers' Market and cooked 6 jelly glasses of jam. Picked green tomatoes while pruning the tomato vines. We lunched on fried green tomatoes and dinned on green tomato casserole served with spaghetti. Last night we enjoyed sleeping on the bed we have set up on the dock. It was cold enough to require the down comforter. Great sleeping weather! 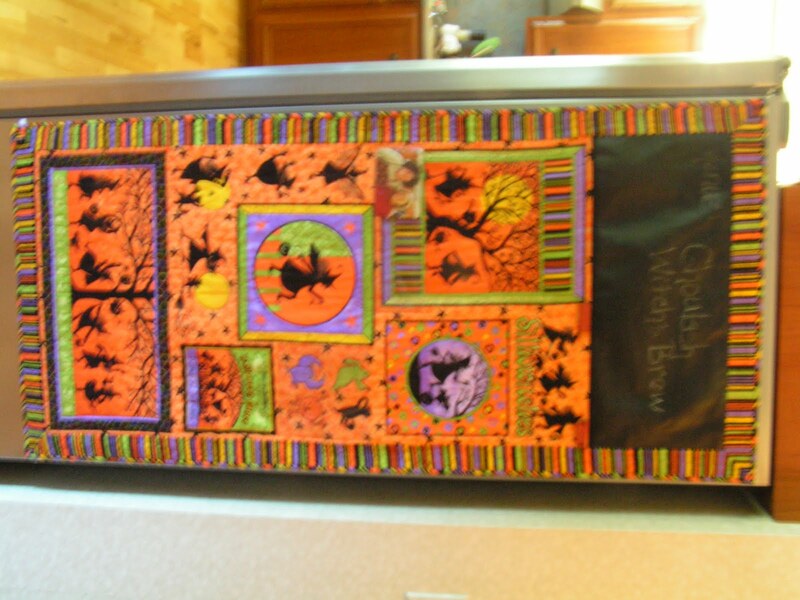 I have designed a Halloween wall hanging for the side of our refrigerator, so it is narrow and long; 26" x 60". 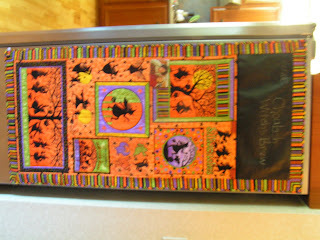 I started with a Halloween panel, added a piece of blackboard vinyl at the top and bordered the whole thing. After quilting it on my longarm, I zigzagged clear vinyl pockets for pictures, greeting cards and recipes. I then added casings to hold magnet strips in five places on the back of the wall hanging. These casings were stitched on by hand. The magnet comes in a coil from Michael's Craft Store and is easily cut with a pair of scissors. I have to learn how to rotate the picture on my blog. Hopefully my daughter will take care of this problem, hint, hint.